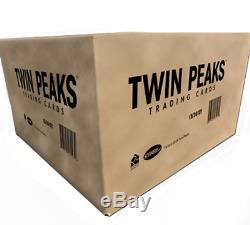 TWIN PEAKS TRADING CARDS FACTORY SEALED CASE OF 12 BOXES. One factory sealed CASE, which contains 12 factory sealed boxes and an exclusive case topper card. Each sealed box contains 24 sealed packs with 5 cards per pack. Each sealed box is guaranteed to contain one complete 90 card base set, two random authentic hand-signed autograph cards and two retro parallel base cards. There are also several great insert cards randomly inserted (see below for more information). With this sealed case, you will receive at least 24 autograph cards in total! The cards in the base set contain detailed plot synopses of all 30 episodes of the original series! PRODUCT INFORMATION AS OF MAY 19, 2018. Kyle MacLachlan (as Dale Cooper). David Lynch (as Deputy Director Gordon Cole). Sheryl Lee (as Laura Palmer). David Duchovny (as Agent Denise Bryson). Jim Belushi (as Bradley Mitchum). Sherilyn Fenn (as Audrey Horn). Madchen Amick (as Shelly Johnson). Michael Ontkean as Sheriff Harry S. Peggy Lipton (as Norma Jennings). Dana Ashbrook (as Bobby Briggs). Wendie Robie (as Nadine Hurley). James Marshall (as James Hurley). Kimmy Robertson (as Lucy Moran). Everett McGill (as Ed Hurley). Chris Mulkey (as Hank Jennings). Kenneth Welsh (as Windom Earle). Michael Horse (as Tommy "Hawk" Hill). Piper Laurie (as Catherine Martell). Carel Struycken (as The Giant). Ray Wise (as Leland Palmer). Gary Hershberger (as Mike Nelson). Kyle MacLachlan (as Dale Cooper) and Sheryl Lee (as Laura Palmer). Kyle MacLachlan (as Dale Cooper) and Sherilyn Fenn (as Audrey Horne). Madchen Amick (as Shelly Johnson) and Dana Ashbrook (as Bobby Briggs). Wendy Robie (as Nadine Hurley) and Everett McGill (as Ed Hurley). Peggy Lipton (as Norma Jennings) and Chris Mulkey (as Hank Jennings). Sheryl Lee (as Maddy Ferguson) and James Marshall (as James Hurley). 90 Card Parallel Retro Base Set. 54 Twin Peak: A Limited Event Series Episodic Cards. 42 Twin Peaks Character Cards. 2 "It Is Happening Again" Poster Cards. We have been in this business for over 15 years! We pride ourselves in our professionalism and attention to customer service. This means that you get first class service and the lowest possible pricing for products made by these manufacturers! We sell only top quality, top condition products - all singles and sets we sell are in mint/near mint condition unless otherwise noted. With every sale we make, we remember that YOU keep US in business! Small sets will generally be in one team bag sandwhiched between two top loaders. Larger sets will not have any top loaders and be divided up into seperate team bags. The cards inside will be safe, but the boxes themselves will not arrive in perfect condition. Your order will be packed inside of a sturdy box with plenty of peanuts around it to protect the item(s). Please be aware of your country's import laws prior to purchasing from us. 9 Item Condition : In general, all items we sell are in mint/near mint condition and any exception to that will be clearly noted in the listing description. By "mint" or "near mint" condition we are referring to the condition of the actual card i. Free of dents, dings, scratches, or other defects caused by mishandling. We are NOT referring to printer defects such as offset images, hand-signed autographs that run off the edge of the card, poor quality signatures, or any other similar issue that occured at the factory/printer. PLEASE NOTE THAT UNLESS OTHERWISE NOTED, ANY IMAGES SHOWN ARE STOCK PHOTOS REPRESENTATIVE OF THE CARD/ITEM FOR SALE AND NOT AN IMAGE OF THE ACTUAL CARD YOU WILL RECIEVE. The common exception to that is PRE-SALE items, which will be clearly noted in the description above. ABOUT BUSHKILL CARDS AND GAMES. Bushkill Cards and Games has been operating since 1997, first under the name Picard's Grand Auctions and then our new name in 2004 when we moved to the Bushkill Township-Nazareth area. And yes, we are named after a geographical place and not politically or otherwise oriented! In 2006, we added Star Trek trading card products by Rittenhouse Archives to our catalog. We continued to grow and expanded our catalog to ALL of Rittenhouse Archives products, becoming an authorized distributor for that company. Finally in 2011 we opened a brick and mortar retail location in Wind Gap PA (Northern end of the Lehigh Valley). We keep most of the current Rittenhouse products in stock in the form of sealed packs, boxes, singles, and sets. We have also begun stocking Magic The Gathering by Wizards of the Coast and Topps sports and entertainment products. We price the products we sell as competitively as possible. Without your satisfaction and repeat business, we would not still be in business! The item "2018 Twin Peaks Trading Cards Factory Sealed 12 Box CASE with 24 Autographs" is in sale since Saturday, May 19, 2018. This item is in the category "Collectibles\Non-Sport Trading Cards\Sealed Trading Cards". The seller is "bushkill_cards_and_games" and is located in Wind Gap, Pennsylvania.